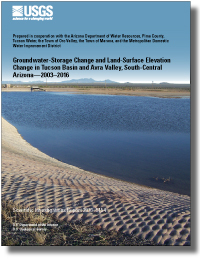 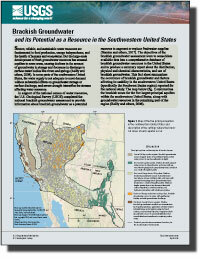 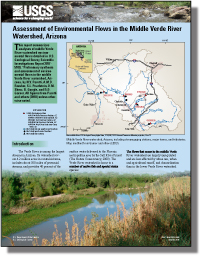 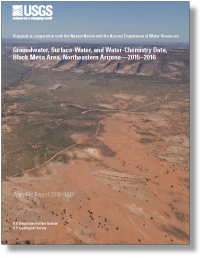 Gungle, Bruce W.; Paretti, Nicholas V.
Gungle, B., and Paretti, N.V., 2018, Assessment of environmental flows in the middle Verde River watershed, Arizona: U.S. Geological Survey Fact Sheet 2018-3062, 6 p., https://doi.org/10.3133/fs20183062. 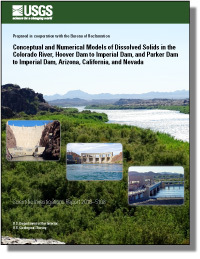 Anning, David W.; Coes, Alissa L.; Mason, Jon P.
Anning, D.W., Coes, A.L., and Mason, J.P., 2018, Conceptual and numerical models of dissolved solids in the Colorado River, Hoover Dam to Imperial Dam, and Parker Dam to Imperial Dam, Arizona, California, and Nevada: U.S. Geological Survey Scientific Investigations Report 2018–5108, 34 p., https://doi.org/10.3133/sir20185108. 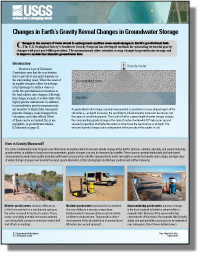 Anning, David W.; Beisner, Kimberly R.; Paul, Angela P.; Stanton, Jennifer S.; Thiros, Susan A.
Anning, D.W., Beisner, K.R., Paul, A.P., Stanton, J.S., and Thiros, S.A., 2018, Brackish groundwater and its potential as a resource in the southwestern United States: U.S. Geological Survey Fact Sheet 2018–3010, 6 p., https://doi.org/10.3133/fs20183010.